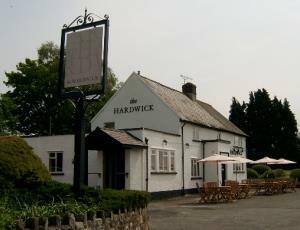 The Hardwick01873 854220work Restaurant with RoomsAward winning restaurant with rooms run by chef Stephen Terry, and his wife Joanna. Menus specialising in local and seasonal produce. Relaxed, comfortable dining experience. Eight luxury bedrooms featuring a king size bed with either an ensuite walk-in shower or bath with shower. All rooms have Sony flat screen HD TV and DVD/Blu-ray player, a Roberts DAB radio with iPod/iPhone connection, Wi-Fi access and a treat-packed minibar. Award winning restaurant with rooms run by chef Stephen Terry, and his wife Joanna. Menus specialising in local and seasonal produce. Relaxed, comfortable dining experience. All are double rooms, one of which has an additional sofa bed and can be a family room and another that can be a twin. Prices are from £145 to £165 per room with breakfast or £95 single occupancy from Sunday to Thursday.